Begin your bed makeover with a clean mattress and fresh linens. Indulge in luxury, or sleep easy with bed makeover ideas that fit most any style & budget. You can buy a cheap mattress online here if yours has seen better days. The average person spends a third of each 24-hour day sleeping in his bed. If you’re planning to remodel your bedroom, then you’ll want to give plenty of thought to your dream bed. A bed makeover can be as simple as adding a new comforter or as luxurious as adding royal drapes and silk linens. Whatever your ideas – simple or elaborate – the place to start your bed makeover is with a good cleaning. You have a vision of of how you want your dream bed to look. You’ve cleaned away the dust bunnies and clutter from under the bed. Where do you go from there? Strip the bed completely (including any mattress pads or zippered protectors). Wash everything – wipe down the plastic protectors or follow manufacturer’s cleaning instructions. If the weather permits and you have clotheslines, then hang linens outside to dry. Sprinkle a light coating of baking soda over the mattress and allow it stay for at least a few hours to absorb any moisture, dirt and odors. Vacuum the mattress with the machine’s furniture attachment until the baking soda is gone. You can get a little extra life out of a mattress that sags on one side by flipping or turning the mattress. This is a good time to check the condition of the box springs if there is one and the bed frame. Repair or replace any broken parts. Incidentally, and as awful as it sounds, this is also an opportune time to check for bedbugs. The U.S. Environmental Protection Agency has complete information on bedbugs on their website and recommendations for managing a bedbug infestation. Depending on your preference and taking into account the climate in your area, choose new bed linens wisely. A simple change like mixing coordinating solid color and printed sheets can give a bed a facelift. Here are a few practical and decorative tips for sprucing up an old bed’s appearance. Choose 100% cotton or bamboo sheets in the summer; these naturally feel cooler. Flannel sheets are great for winter and colder climates. Bamboo sheets such as those shown on the website, Buy Bamboo Sheets, are known for their antibacterial qualities and are quite popular when it comes to adding a little luxury to everyday life. When purchasing sheets, check the thread count to help determine the quality. Southern Living magazine’s website explains why a sheet’s thread count is important in an informative Sheet Thread Count Guide for consumers. Coordinate solid and printed sheets you already have on hand for a different look. Or, if your budget allows, invest in a bold new color or over-the-top print to liven things up. Choose carefully when buying bed sets; sets typically include a comforter, sheets, pillow shams, pillowcases, and a bed skirt. Sets can be pricey and the look will have to do until your next bedroom makeover. Check all materials so you’ll know what you’re getting. Replace an old headboard and/or foot board with a new style, or paint the old one for a whole new look. Try decorative pillows for a quick and inexpensive bed makeover. Take a photo of your bed with you when shopping for decorative pillows; it’ll be easier to picture the end result. 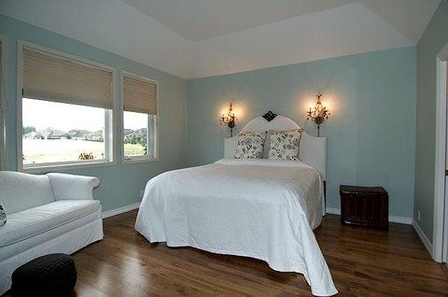 Try to pick something that complements the bedspread or build on a dominant color in the room. A bed makeover doesn’t have to cost a lot. The right combination of materials and colors will put your bed center stage; it can give the entire room a whole new personality. Decorate with pillows, add a headboard that doubles as a bookshelf or add extra lighting over the bed to create a warm inviting atmosphere. Be creative, but plan carefully to avoid wasting money. A beautiful bed has a luxurious feel; in fact, it might even help you sleep better.